Lukas worked as a miner 40 years. He used to enjoy soccer and going to the gym, he speaks fondly of his time on the mine's soccer team. In 2014 he started feeling weak and a tightness in his chest. 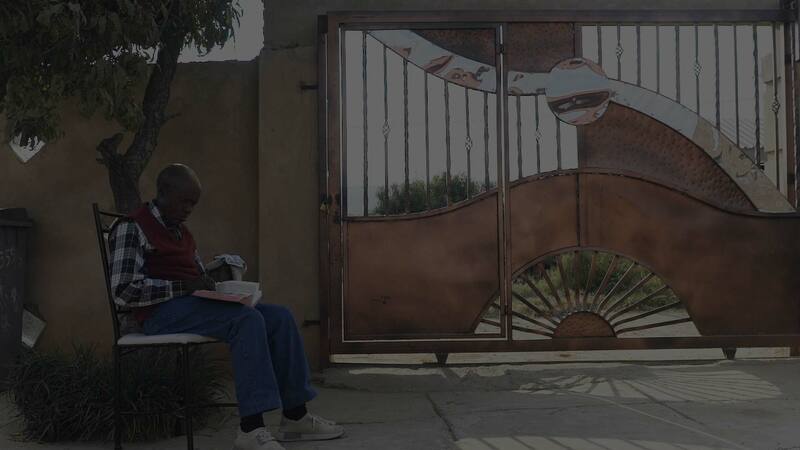 He went to the Carletonville one-stop centre where he was diagnosed with severe silicosis. He has less than 20% of his lung capacity. Thanks to Sister Ntabiseng at the one-stop centre, who assisted with his check-ups and made sure that his paper work was in order, Lukas received a lump sum payment of R90,000. Lukas donated a portion of the money to his church and used the rest to build a small two-room house, purchase a bed, a wardrobe and secure his home with a wall and a gate. Lukas now survives on a monthly grant payment of R1,600. He feels the money was not enough, because if he could choose, he would still be playing soccer and working with his friends. He still enjoys working in his vegetable garden but gets sad because he tires so easily. The Chamber of Mines and six mining companies (African Rainbow Minerals, Anglo American, AngloGold Ashanti, Gold Fields, Harmony and Sibanye) have supported the work of the national Department of Health in ensuring former mineworkers covered by the Occupational Diseases in Mines and Works Act are able to claim and receive all the occupational health compensation benefits to which they are entitled. The Chamber of Mines has funded the data capturing of over half of 900,000 hard copy files, and contributed around R34 million towards tracking and tracing former mineworkers with occupational lung diseases (OLDs), administrative improvements in the compensation system, and providing the public health system in labour-sending areas with the capacity to examine for OLDs and assist with compensation claims. Companies have seconded a senior executive and six medical doctors to assist with management and the certification of claims; paid over R58 million for various services and committed resources (valued at some R30 million) to the endeavour. In the past year 15,000 backlog claims were certified, and the expedited tracking and tracing of thousands of beneficiaries is underway.